Post your remembrance of Dr. Cynthia Fitch-Steenson. Cynthia Fitch-Steenson, former associate professor of biology at Seattle Pacific University, died June 13, 2013, at the age of 50. Known for her leadership of SPU’s Pre-Professional Health Sciences program, Cindy was a dedicated advisor of students who sought careers as doctors, dentists, physical therapists, optometrists, and other careers in health care fields. Cindy was born in Amarillo, Texas. 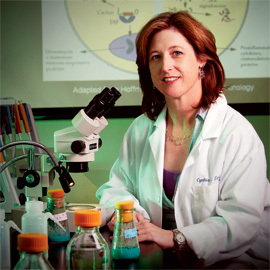 She attended McMurry University and earned a doctorate in genetics from Iowa State University. She then moved to Seattle to do post-doctoral work at the Howard Hughes Medical Research Institute at the University of Washington. Cindy served as a member of the SPU faculty from 1994 to 2012. Because of her careful advising, SPU pre-med students achieved exceptionally high acceptance rates to medical school and other professional health programs. Cindy was advisor to the SPU student group Ivy Honorary and president of the Western Association of Advisors for the Health Professions. In her area of study, genetics, she encouraged students to think deeply about biomedical ethics from a Christian perspective. She was honored with the President’s Award for Excellence in 2004 and named a top pre-med advisor by the Northwest Osteopathic Medical Foundation in 2009. “Our love for her and deep appreciation for her many contributions to our community continue on,” says SPU Provost Jeff Van Duzer. Cindy is survived by her husband, Andy Steenson, and three sons. Through the generous support of two of Cindy's earliest advisees, a scholarship fund in Cindy's name has been established to benefit pre-professional health science students at SPU to honor her legacy. To make a gift online, visit advance.spu.edu/giving/giftnow/, and please specify “For Cynthia L. Fitch-Steenson Endowment” in the comment box. To make a gift by mail: Make checks payable to Seattle Pacific University, for the Cynthia L. Fitch-Steenson Endowment. Mail to SPU Gift Processing, Office of Development, 3307 3rd Ave W., Seattle, WA, 98119-1997. Any questions about the endowment can be directed to Bryan Jones, SPU development officer, at 206-281-2250 or bryan@spu.edu. Share your remembrances of Cindy here, and see remembrances posted below in this moderated bulletin board. Posted Friday, January 14, 2016, at 5:55 p.m. I can quite confidently say that without Dr. Fitch in my SPU life I would have been in a terrible mid-life crisis doing who knows what. She was such a precise director of focus and potential before I even knew what I wanted. Her ability to motivate and bring self-awareness to college-age kids was epic. What a legacy. She had the skill of holding you highly accountable to the best standards, and pushing hard for dreams to come. Cindy had all the knowledge and advice nobody else in my life had at that time. I consider Cindy one of my greatest allies and biggest reasons for succeeding in dentistry as I did. God bless you, Cindy. So sorry to hear about this so late. Posted Tuesday, October 1, 2013, at 4:57 p.m.
She was a great inspiration in my life and is the reason I became a physician. I'm so sad she's gone. Posted Thursday, July 11, 2013, at 12:07 p.m. I am so sad to learn of Cindy’s passing. My favorite memories of her are when we organized a group of women for a triathlon. Cindy was the person you needed on your team, because she was always recruiting! She was a great organizer, and our training adventures included working out at a private club, swimming in Lake Washington, and running in the Firecracker 500 on the 4th of July, which started at 11:55 p.m.! Her energy and enthusiasm were infectious. As a friend at SPU, I will miss her and her presence on campus. Posted Tuesday, July 9, 2013, at 4:18 p.m. Professor Fitch was the deciding factor in our son choosing SPU. The talk she gave to prospective pre-health science students was interesting, fun, and inspiring. Then a few days before “Welcome Week” for the freshmen, my husband was in a terrible accident. When we contacted her about Eli skipping those first few days, she was so sweet, understanding, and accommodating. It made a horrific time more tolerable knowing that she had our family on a prayer list at the school, too. My heart goes out to her family; they lost her much too early. Posted Friday, July 5, 2013, at 9:08 p.m. Taking PPHS core classes with her throughout my pre-med years really helped shape my perspective. Her passion for her students and the field of medicine have helped bring me to where I am today. She is truly an inspiration and will be missed dearly. Posted Friday, July 5, 2013, at 3:15 p.m. I had Cindy for one of my Freshman CORE classes -- I don't remember the exact name, but I remember learning more about ethics and science. Through her class, I volunteered at several different blood drives, encouraging people to sign up as Bone Marrow donors. She gave a talk at the library, and quoted from one of my papers -- she also let me know ahead of time, so I could have my mom there, a breast cancer survivor. I wish I had a better memory! She was a wonderful lady and friend. She cared about her students and it was obvious from her stories that she loved her family. I was so sorry to hear about her passing ... We had family from out of town, or I would have been at her memorial. She will be greatly missed. Posted Friday, July 5, 2013, at 11:54 a.m. I took Microbiology with her and I stink at science. I was hoping to go to the Nursing program. She promised to pass me if I promised to change my major. I did and we laughed at graduation that I made the right move. SO SAD to hear of her passing. Posted Wednesday, July 3, 2013, at 5:55 p.m.
Dr. Fitch’s work with pre-med students was what drew me to SPU when I first started looking at universities. The past two years have exceeded my expectations, and I couldn’t be happier. Although I only knew her a short time, her enthusiasm, humor, and passion for students will always remain in my memory. Posted Tuesday, July 2, 2013, at 2:34 p.m. The first time SPU’s pre-med students had a 100 percent acceptance rate, I had the pleasant assignment of interviewing Dr. Fitch for Response. We met on a Friday night at an Eastside eatery, and I was struck by how much she cared about her students. We talked for more than an hour, as she recounted how proud she was of them and how committed she and other SPU professors were to helping students achieve their goals and find their calling. I was sad to hear of her passing, and my prayers are with her family.